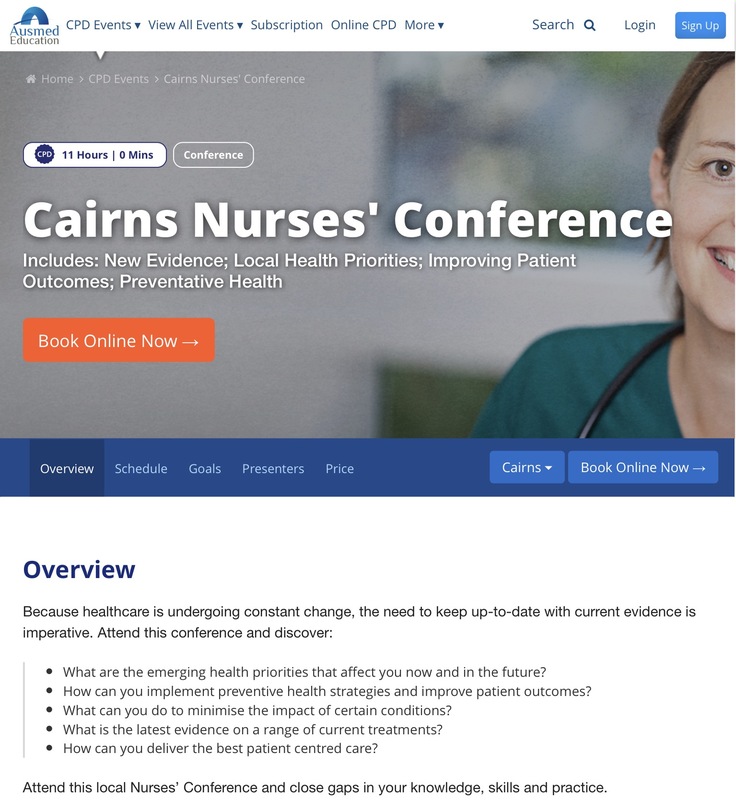 This afternoon I’m presenting at Ausmed’s Cairns Nurses’s Conference. The title of the presentation is “Mental Health and Cognitive Changes in the Older Adult”. What are normal age-related changes to the brain and consequent behavioural signs? How are these changes different to the onset of mental health disorders such as schizophrenia, psychosis or bipolar disorder? What practical behavioural strategies may improve outcomes for a person with a mental health disorder and cognitive changes? That’s it. Short and sweet. I hope this is of some use/interest to those who are attending the conference, and (maybe) some people who are not able to get along. As always, feedback is welcome in the comments section below. This entry was posted in Blog and tagged anxiety, ausmed, cairns, conference, delirium, dementia, depression, emotional intelligence, mental health, nurse, nurses, nursing on 15 December 2016 by Paul McNamara. In related news, ‪about 8.000ish new nurses graduate in Australia every year [2014 info: source]. 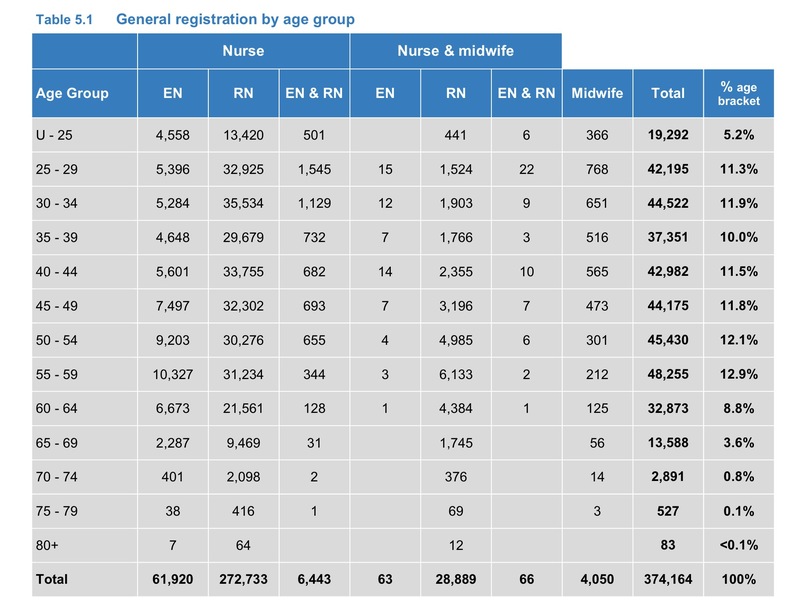 17,089 of Australia’s nurses and midwives are aged 65+. 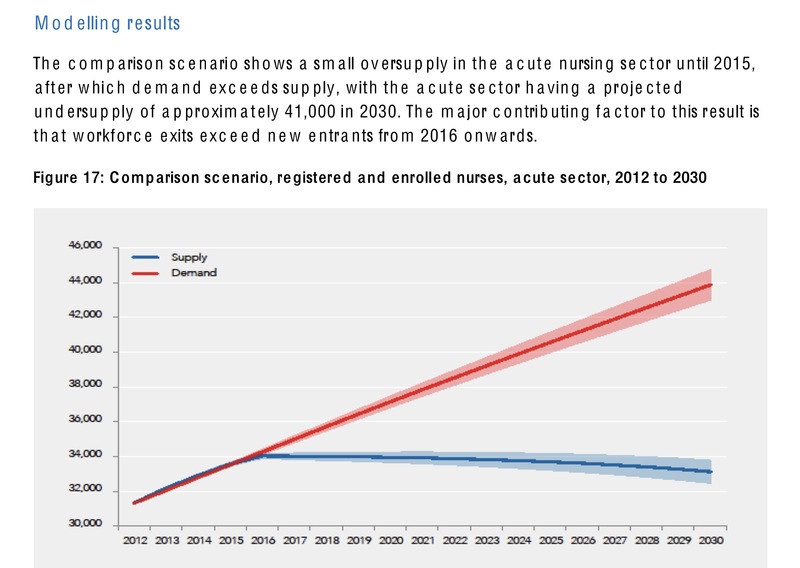 39% of Australia’s nurses/midwives are aged 50+ (not that there’s anything wrong with that). 1. Nurses graduate in packs, but retire one by one. Today there are about 8000 freshly minted Australian RNs wondering if they’re going to get a gig. I don’t know how many of existing RNs are on the verge of retirement, but the demographic info in the table above would suggest at least 8000 will retire within the next year. Have you read the small print in the ‘Modelling Results’ chart above? The last sentence reads, “The major contributing factor to this result is that workforce exits exceed new entrants from 2016 onwards.” [page 37] Be patient. The jobs will become available. 2. If it’s practical to chase the work (ie: go rural/remote) do so. You’ll pick-up some deadly skills, and will be a better future employment prospect than someone who hasn’t worked as a RN. 3. Have you heard the cliché re not waiting for Mr/s Right, and being comfortable with Mr/s Right-Now? Same with your first few RN jobs: anything will do to get your foot in the door. Don’t knock back an unappealing gig. Quitting is quicker/easier than applying. 4. You know that other cliché “It’s not what you know, it’s who you know”? It’s who you ARE, and who knows it. If you’re well suited to a particular speciality/hospital/ward make sure that it’s not a secret. Make sure you’re friendly with all staff, but be especially sure that the senior staff (the people with their hands on the levers) know that you’re an asset. If they know you’ll make their workplace better, they’ll be keen to grab you when the funding/positions allow. 5. This one is the important one. It’s REALLY disheartening to spend 3+ years working towards something, and then find out that that something isn’t there where you expected it to be. The fragile self-confidence of a novice RN isn’t geared-up for a kick in guts like that. It’s not just a disappointment, it’s an injury to the ego. Don’t spend all your money at Dan Murphy’s. Do fun stuff despite feeling crap. The data tells us that there are RN gigs in the pipeline. Do whatever it takes to be sure that you’re ready when your opportunity arrives. 6. Expect to experience grief emotions. You probably remember the Kübler-Ross 5 stages thing, as a quick reminder: denial, anger, bargaining, depression and acceptance. Anger and depression are uncomfortable, but very understandable, emotions. Find a safe way to express them (pro-tip: resist the temptation to spray paint swear words on your university or local hospitals). 7. On bad days, have another look at the chart at the top of the page. Australia’s health system needs you! 8. Find things that help you stay optimistic. Music works for me. Just in case it works for you too, here’s a song of determination and defiance. Turn it up! As always, feedback/corrections/additions are welcome in the comments section below. This entry was posted in Blog and tagged anxiety, graduate, nurse, nurses, nursing, student on 4 December 2016 by Paul McNamara.